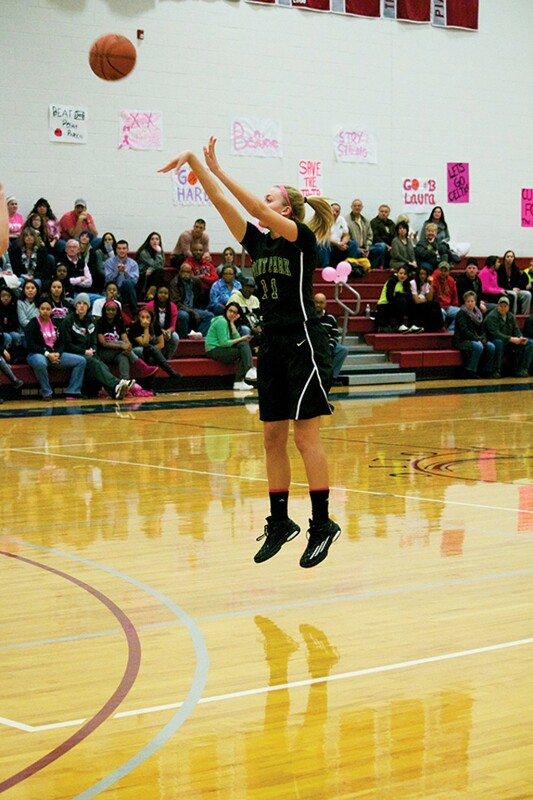 Sophomore guard Celina DiPietro shoots the ball in hopes of scoring against Carlow last Tuesday. After a heartbreaking loss to IU Southeast, the Point Park women’s basketball team defeated two conference foes on the road – increasing the team’s overall record to 21-3 and its KIAC record to 8-2. On Feb. 3, Point Park beat Carlow 75-64. Carlow led in the game for the first 1:35 but never recaptured the lead. The Pioneers started the game on a 23-5 run and never looked back. Starting guard Kelly Johnson contributed eight points to that opening run. At the end of the first half, Point Park had a 41-26 lead over Carlow. Throughout the second half, the Pioneers maintained at least an 11-point edge over the Celtics. Johnson led the team in points with 33, which is a single game best for her. Johnson was perfect from three-point range; she went 4-4 on attempted treys. From the field, Johnson made 61 percent of her shots and racked up six steals and six assists. Point Park starting forward Carly Forse generated 18 points – six of which were scored in the opening four minutes of the game. Starting forward Ja’Nia McPhatter put up nine points and grabbed nine rebounds. A dominant second half gave the Pioneers a 103-79 victory over IU East on Feb. 8. The win gave Point Park a 2.5 game advantage over IU East in the KIAC North Division standings. At halftime, IU East held a 48-40 advantage over the Pioneers; however, the Pioneers bounced back and outscored IU East by over 30 points in the second half. After DiPietro made a basket to put Point Park up 52-50 with 15:48 remaining, IU East never led in the game again. The Pioneers started the second half on a 32-6 run, which gave the team a 72-54 lead with 11:41 left in the game. For her second consecutive game, Johnson scored 30-plus points. She amassed 31 points against Carlow, and she produced 10 assists, which gave her a double-double. 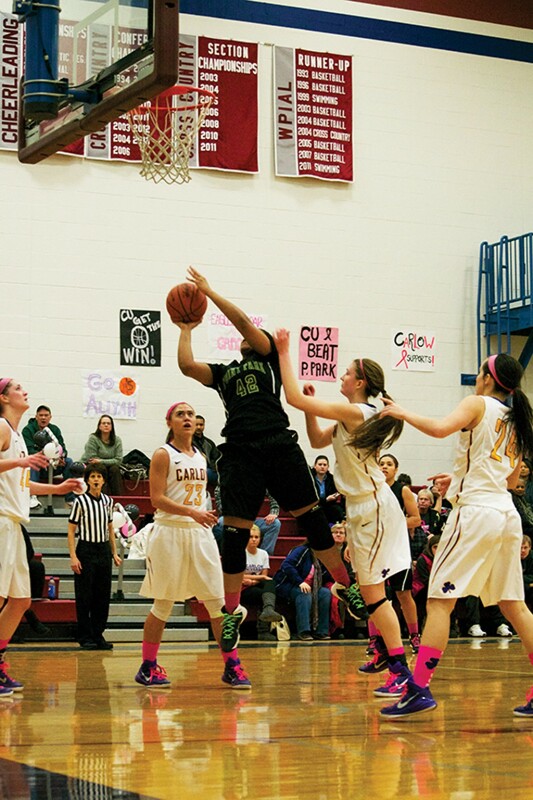 Johnson recorded seven steals; she was only three steals shy of a triple-double. Alexa Xenakis – who is a starting guard for Point Park – scored 25 points versus Carlow. Xenakis shot 60 percent from three-point range. “I just did my job that I’m put on the court to do, which is shoot,” Xenakis said. Junior forward McPhatter tallied 17 points, grabbed six rebounds and recorded two steals. “All around I had to be more aggressive and that showed,” McPhatter. Next up on the schedule for Point Park is a home game on Feb. 10 against Rio Grande, the team that holds a one game lead over the Pioneers in the KIAC North Division standings. “People may think it will be tough for us since we’re playing a huge game two days after we just had a tiring game, but that’s what we’re used to, and that’s what we live for,” Xenakis said. If the Pioneers defeat Rio Grande, they will reclaim first place in the KIAC North Division. And Point Park surely is determined to come out victorious.